In order to provide the patients with good and quality health and social care, it is important that the work environments and ethics of the social works should be observed. The process of social care is a delivery process to the service users which involves the social workers who have based their arguments on the systematic body of knowledge whose major evidence is found from previous done studies and practices (Atwal & Mcintyre 2013). This means that the work done is based on research and therefore is scientifically proven. Contemporary development includes local and indigenous knowledge. This is majorly done in terms of looking at the practices for various conditions, analyzing them and making them up to date. The major interest of contemporary development in the health and social care sector is analyzing human beings and their environments. This can be explained further as their interaction. The development also uses several theories in analyzing the complex situations. For instance they use human development theories, social theories and social systems. As illustrated earlier, the social works are very important in the health and social care delivery. It is therefore important for their employers to ensure that their places of work are in line with the ethical considerations as illustrated by the health sectors. They should have effective and social work practice. This is to ensure that they are able to deliver their best to the patients. Personalized care requires corporation from all sectors f health. They should be given a list of their work responsibilities; they should also be familiarized with the organization and social work objectives (Australia 2011). This means that they should be made aware of all the expectations of the organizations and how the service users should be treated. They should also provide the service users with the protection of their interests as required by the health standards. The most important thing in the environment of the health and social care delivery is to ensure that the social workers have been informed on the good standards of practice and quality services. This should include all their work including the personalized care (Carrin 2009). The social workers should be competent enough in order to help in factors such as improving the health care, welfare and well being of the disabled people. There is a major connection in the sectors of health as listed above. Health, wellbeing, social care and delivery services work interdependently. This is because the major objectives of any healthcare systems cannot be met is there is lack of cooperation from all this departments. This department's help in the implementation process since they enable the experts to analyze then inter connectedly and come up with informed decisions (Chandra 2009). This is for example in the policy making process. All factors from this department must be understood well in order to ensure that the work is done successfully. By doing this, it is evident that the group of experts will come up with better health practices. By working inter connectedly with various sectors of health, it is important for the end results since this practice encourages consultation between the sectors. By doing this each member of the health committee will have an idea of what is taking place in the areas that they do not work (Palmer et al 2011). This is even much better since it helps in problem solving within the health departments. Contemporary issues have become a major challenge in the health sector for a long time. According to research, these issues are the major reason as to why the health sector cannot meet the standards that they set for themselves. Most of the contemporary issues can be managed however; there are some that cannot be managed. There has been a rise in the lifestyle diseases in the health sector recently. This is because of the types of lives that people lead today. This involves leading a sedentary lifestyle but not participating in enough exercise (Davies, M 2013). This situation has claimed a lot of lives for both the elderly and the children leading to an increase in the mortality rates. In Australia, there are several Medicare locals, this are institutions at the grass roots that offer the health services to the people. This has made the health care to become less effective since there are also some government local hospitals in those areas. The other factor is political interference (Siciliani et al 2013). This factor has lead to less efficiency in the health sector since most of the political parties are fond of politicizing each and every policy that is brought up. This illustrates that the central function has been ignored. The process of policy making involves a series of steps that are required to be followed by the stake holders and the policy making team. 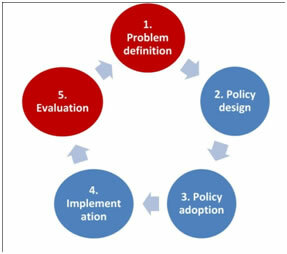 The first step as illustrated in the diagram above is to define the problem that the policy being developed will solve. This is for theis case, the personalization care for the disabled people. The second step is outlining the policy design, this is how the policy will be made and how it will be implemented. The third step is policy adoption. This can be explained as accepting the policy and making it known to the people. This step is followed by the policy implementation; this is where the whole thing is based (Australia 2011). This is because the policy now is being broken down into parts according to the plan set. The final step is the evaluation of the whole process. This is to explain if the policy was implemented successfully and if all the requirements were met. It further explains the achievements which are illustrated by the behavioral change. In addition, the challenges faced are discussed. This process is for the importance of more policies to be made. Disabled people have been a subject of discussion for a very long time. This is simply because they have been a marginalized group. They have their rights infringed and very few people care about them. This is however a pressing issue for the people dealing with the rights of the disabled people. Personalized care for the disabled people was also a point of concern since due to their condition; the general care delivery does not meet all their needs (Grant 2010). This is one of the situations that lead to the formation of the personalized care policy for the disabled people. This policy was to enable them acquire technology and equipment that will enable them lead their lives in a normal manner. This is also the case for their rights and chance to get an equal opportunity in anything they do. There are various policies that have been made and implemented regarding the personalized care of disable people. This is because this is a special group that requires immediate attention in the health sector. Social work is important for this implementation since it enables care delivery and the welfare of the person. National disability strategy for personalized care is a policy strategy that was structured by common wealth, state and territory and local government in partnership with council of Australian governments (COAG) (Wolf et al 2011). It is a policy that has been given a time frame of 2010-2020. This means that the institution has a period of ten years to fully implement the strategy. The policy is mainly interested in placing a platform of improving the lives of the Australians living with disability, their families and their careers. It is majorly determined to ensure that the welfare of this group is well taken care of including their well being (Australia 2011). This includes their ability of solving their social problems and their other problems which present themselves now and in the future. The strategy was planned in such a manner that it should ensure that the six priorities listed in the policy have been addressed by the time frame given. The first priority is that the policy is inclusive and accessible communities. This includes accessibility to public transport, parks, sports and recreational areas. The second priority is to ensure that the people have their rights protected, justice and legislation. Economic security is the third priority of the national disability strategy. Personal and community support is the fourth priority followed by the learning and skills. This is crowned by the last priority which is health and well being. The implementation process of this policy is expected to take ten years. This is because of the type of policy design that was acquired. However, it is possible to evaluate the implementation process up to this level in time. This can be simply illustrated by the change in the well being and welfare of the disabled people. This group of people that was previously neglected is now enjoying their rights like any other person (Atwal & Mcintyre 2013). The major issue which was personalized care is now up to standard. This is because many health systems have adopted the proposal and are working with it in order to improve the health and social care accorded to them. For personalized care, the policy has been implemented fully and successfully. The strengths and weaknesses of the national disability strategy 2010-2020 for personalized care. There are several implications that have presented themselves in the planning and implementation of the strategy named above. There are several strengths that have been noted, however, there are also some weaknesses. One of the achievements of this policy is that it has a long time of implementation. This means that there is enough time to implement each and everything as planned by the stakeholders. The strategy also successfully advocates for the equal allocation of resources and facilities. This was a problem for many years since not all the disabled people are fit to fight for these opportunities (Dean 2012). It is now possible for many of the people to have equal opportunities in sectors such as education sponsorships or in employment sector. These are things such as employment and business opportunities. The policy has also worked well in eliminating social inequalities where the disabled people can also get an opportunity to visit parks and other recreational areas (Sullivan-Marx & Gray-Miceli 2008). It has also ensured that it has covered everything under one roof, these ranges from the economic needs to the social needs of the people. The strategy has also worked perfectly well in prioritizing the health and well being of the disabled people. The weaknesses that have been displayed in the analyzing of this strategy are not many. One of the weaknesses that are obvious to anybody is that the implementation of this policy requires a lot of funds. This means that it is very expensive to maintain looking at their priorities as explained earlier. For instance, to provide the disabled people with personalized care means that they should have customized and specific technology so as to be able to perform this function. They are also need for the equipments that will be given to the disabled people to enable them move and perform normally like other people. The stakeholders in planning for this strategy should have ensured that they have acquired enough funding for this project. This is because without the finances, nothing much can be done (Fitzpatrick & Kazer 2012). The other thing is that this policy might affect a large number of people than expected previously. This is for instance in the situation that and employer did not have a disabled person in their organization. This will make it a must for them to change their policies in order to ensure that the disabled people are incorporated in the employees. This may lead to disruption of the normal working of the organization. Political parties are a major stakeholder in the planning and implementation of a policy. This is because of their impact and contribution in the special program. The political parties are very important in the strategy planning since they give their contributions to the panel of policy making. They participate fully since their main role in the country is to ensure that their people are well presented. They air the views of the disabled people at the grass roots. Political parties also ensure that funding is made available for the whole process (Grant 2010). This is the process of planning and also implementation. They also perform an important role in the regulation of the policy. This is because the political parties are rivals of one another; therefore their main objective is to find the faults of their opponents. They can also be said to be responsible for the checks and balances. They work as watch dogs in monitoring the performance of the whole process. This is in terms of ensuring that the funds are spent in a remarkable manner, corruption is one disease that may bring down the efforts of good work. It is therefore their duty to ensure that all the funds allocated to this project have been used in an accountable manner. The social policy started to show up in the liberal welfare reforms in the year 1906-1914 under the Prime Minister, Herbert Asquith. Thereafter, there were several emergences; old-age pension Act 1908, development Act 1909, labor exchanges Act 1909 and national insurance act 1911. In the year 1942 in the month of December the inter-departmental committee on social insurance and allied services published their report. The contents of the report were majorly the interest on the people. The committee was interested in ensuring that ways have been found in managing the five giants in Great Britain (Hamowy 2007). The five giants which were listed as wants, disease, ignorance, squalor and idleness were the major threat to the welfare and wellbeing of the people. In 1945 there were several Acts that were passed by the parliament. This was following an election victory of the labor. The national insurance Act, National assistance Act and National Health Service Act came into force in July, 5 1948.this welfare systems continued to develop over the decades, by the end of the 20th century, this welfares had restructured most of their systems making the services offered much better. At this time most of the service providers were non-governmental organizations. They were responsible for the funding process which is one of the major challenges in most of the systems. Has policy made a change in the issue? It is evident that policy has made a big impact in the issue of personalized care for the disabled people. This is majorly because of the state at which the situation was years before the planning and implementation of the policy. The major thing that can be vividly seen is that the welfare of the disable and their well being has changed for the better in the recent years. This is because they can now have equal opportunities to various resources and services offered to citizens. They can now be employed since the policy has insisted in the protection of their security in terms of economy. This can be explained further as the business opportunities they receive, they can now have permanent jobs and therefore permanent income (South Australian Council of Social Service 2012). Their rights have also been protected in terms of justice and legislation. It is now clear to many people that a disable person has the same rights and even more privileged. It is therefore a must to respect them and their rights. The policy has also ensured that the disable are able to get personal and community housing support. This is important for their well being. The policy has also ensured that these people received monthly allowances for those who are not able to work. The most important thing is that the strategy has ensured that this population received better health and social care delivery. The government is an important body in the policy making and implementation process. This is because it is a stakeholder in the process. It is determined in making the country a better place for its citizens; this is therefore evident that it has a role to play in the whole situation. The government provides funding for their health policies. This is because the health policies require a lot of money for the implementation of the policies to take place. The government works dependently in facilitation this process (Harris 2008). They work in connection with the treasury, the finance department and the health department in facilitating the important function. The government is also in a position to acquire donors who can help in funding the process. The government also plays a role in the implementing of these policies. This is because they were part of the making, they are therefore aware of the guidelines that should be followed. This is followed up in a supervision process. The government ensures that the legality of the policy is approved. This means that everything proposed in the policy is acceptable ethically. Personalization is a process that is proposed by the various medical theories that are determined in providing a better health and social delivery. The personalization of care gives the service users a chance to choose what they want to receive (Warwick-Booth et al 2012). It also gives them a chance to be served in a honorable manner while they are the ones in control of every step that takes place. It also emphasizes on the intervention and in the early prevention of the occurrence. This is for example in terms of disability. There are some disabilities that come as a result of instances that could be prevented earlier. The most important thing about this care process is that the interventions and treatment are made in such a manner that they have been narrowed down to suit the specific needs of the patient and their condition (Hughes et al 2010). This includes both the equipment used and the technology used. The technology is used in the diagnosis, care process and the treatment of the condition. Personalization has played a major role in the development of the user services. This is well illustrated by the points explained above. Personalization also gives the expert and the patient an opportunity to work well and interact even better. Funding in the policy making process and implementation is given by various people. This is illustrated by the manner which the process is done. The process requires money for the making of the policy, implementation and lastly the monitoring and evaluation process. The government funds most of these policies since as explained earlier; they have an interest in making everything good for their citizens. The government is also in a position to get foreign donors who can help with the process. Non- governmental organizations are also responsible for funding; this is because as an organization they may have objectives that may match the work of the policy. It is therefore important for the non- governmental organization to support them for their ideas and ideologies. Insurance companies also offer financial support for these policies. This is because most of the patients in Australia are covered medically. They also help in paying their bills and sustaining them (Ifip World Computer Congress, & Bramer 2008). Well wishers are also a group of people who are interested in helping their friends in going through this process. This is also a way of getting funding for the policy. The policy achieves a number of things; they ensure that all the disabled people get better and personalized care for their conditions. This improves the health and social care delivery system. The policy also achieves in ensuring that all the people both the disable and the rest get equal opportunities in the country. This has helped a great deal in reducing discrimination for the disabled. There are various theories that have been used in the implementation of the personalized care of patients. One of the main theories in this practice is the personalized medicine. This is a theory that has been discussed in various books and even conferences. The main objective is to provide customized care delivery for patients with certain conditions. The theory can at times be denoted as PM. The P in the denotation means patient, this can be explained as the specific interaction that a doctor and patient get through this process (Lloyd & Heller 2012). This is possible since if this is done a doctor can be more effective and competent. The theory insists that the medical decisions for patients, health care and practices to be narrowed down to an individual. They also insist in using of technology in discovering and caring for a patient's condition. This enables personalization. Personalized medicine is a theory that insists on the learning of the essential skills of managing and operating machinery and technology for this specialized care. This is because if the doctors have not been familiarized with this skill, then it won't be easy for them to deal with disabled people. The theory also insists that it should be taken form theory to practice as soon as it is learnt (Grant 2010). This theory is concerned with making the situation for the disabled people to a better place. Personalized care is quite important since it is specific to the needs of a patient. The theory also advocates for this personalization of care since it ensures that with time the cost of health and social care is reduced in a large amount. In conclusion it is worth noting that the personalized care for the disabled people is a way of improving the health and social care for the service users. This is because this process enables the service users to control the services that they want to receive. It also enables them to get specialized care since the services offered to them have been broken down by experts to meet the needs and wants of the patients. Policies have been made in order to help in the implementation of the proposal of personalized care. Policies have been supported by many stakeholders as listed in the above paper. It is also important to ensure that the environment of social workers is looked into since they are the service delivery group. Atwal, A., & Mcintyre, A. 2013. Occupational therapy and older people. Chichester, West Sussex, Wiley-Blackwell. Australia. 2011. National disability strategy: 2010-2020 : easy English version. [Canberra], Dept. of Families, Housing, Community Services and Indigenous Affairs. Australia. 2011. National disability strategy: 2010-2020 : summary document. [Canberra], Dept. of Families, Housing, Community Services and Indigenous Affairs. Carrin, G. 2009. Health systems policy, finance, and organization. Amsterdam, Academic Press. http://public.eblib.com/EBLPublic/PublicView.do?ptiID=477340. Chandra, P. S. 2009. Contemporary topics in women's mental health global perspectives in a changing society. Chichester, UK, Wiley-Blackwell. http://public.eblib.com/EBLPublic/PublicView.do?ptiID=547053. Davies, M. 2013. The Blackwell companion to social work. Hoboken, Wiley Blackwell. http://search.ebscohost.com/login.aspx?direct=true&scope=site&db=nlebk&db=nlabk&AN=536731. Dean, H. 2012. Social policy. Cambridge, Polity. Fitzpatrick, J. J., & Kazer, M. W. 2012. Encyclopedia of nursing research. New York, Springer Pub. Grant, G. 2010. Learning disability: a life cycle approach. Maidenhead, McGraw Hill/Open University Press. Hamowy, R. 2007. Government and public health in America. Cheltenham, UK, Edward Elgar. http://search.ebscohost.com/login.aspx?direct=true&scope=site&db=nlebk&db=nlabk&AN=182140. Harris, D. M. 2008. Contemporary issues in healthcare law and ethics. Chicago, IL, Health Administration Press. Hughes, J. C., Lloyd-Williams, M., & Sachs, G. A. 2010. Supportive care for the person with dementia. Oxford, Oxford University Press. Ifip World Computer Congress, & Bramer, M. A. 2008. Artificial intelligence in theory and practice II: IFIP 20th World Computer Congress, TC 12 : IFIP AI 2008 Stream, September 7-10, 2008, Milano, Italy. New York, Springer. Lloyd, C. E., & Heller, T. 2012. Long-term conditions challenges in health and social care. London, SAGE. http://search.ebscohost.com/login.aspx?direct=true&scope=site&db=nlebk&db=nlabk&AN=595700. Palmer, M., & Dilworth-Anderson, P. 2011. Annual Review of Gerontology and Geriatrics Pathways Through The Transitions of Care for Older Adults. New York, Springer Pub. Co. http://public.eblib.com/EBLPublic/PublicView.do?ptiID=819569. Siciliani, L., Borowitz, M., & Moran, V. 2013. Waiting time policies in the health sector what works? Paris, OECD. http://oclc-marc.ebrary.com/id/10672300. South Australian Council Of Social Service. 2012. National, state and territory councils of social service (COSS) submission to National Disability Strategy 2010-2020 - Laying the Groundwork (2011-2014). Unley, S. Aust, South Australian Council of Social Service. Sullivan-Marx, E., & Gray-Miceli, D. 2008. Leadership and management skills for long-term care. New York, Springer Pub. http://site.ebrary.com/id/10265438. Warwick-Booth, L., Cross, R., & Lowcock, D. 2012. Contemporary health studies: an introduction. Cambridge, Polity Press. Wolf, J. A., Hanson, H., & Moir, M. J. 2011. Organization development in health care: high impact practices for a complex and changing environment. Charlotte, NC, Information Age Pub.